Get out your champagne glasses…because it’s time to celebrate! The Little Epicurean is getting married! 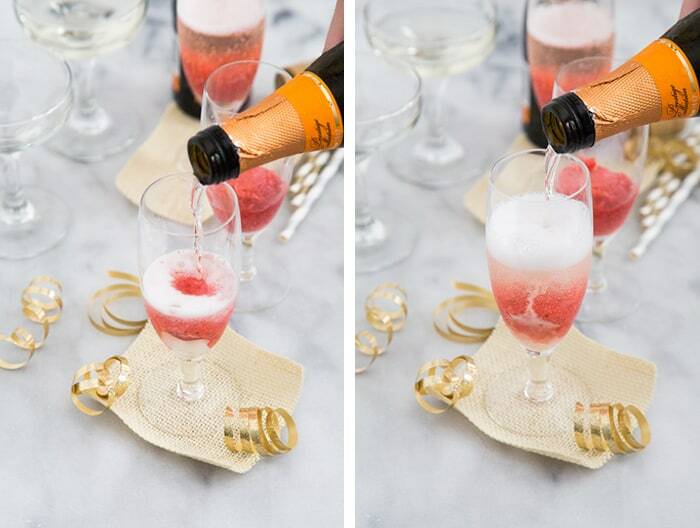 A glass of something sweet and bubbly is definitely in order. Traditionally, a Bellini is made with peach puree and sparkling wine. I chose to go with strawberry sorbet because it adds a fun and delicious pop of color. If you don’t have the time to make your own strawberry sorbet, you can always purchase your favorite one from the market. You can easily make a non-alcoholic version using sparkling apple cider. Strawberry and apple cider tastes just as wonderful together! Now, onto the proposal story. 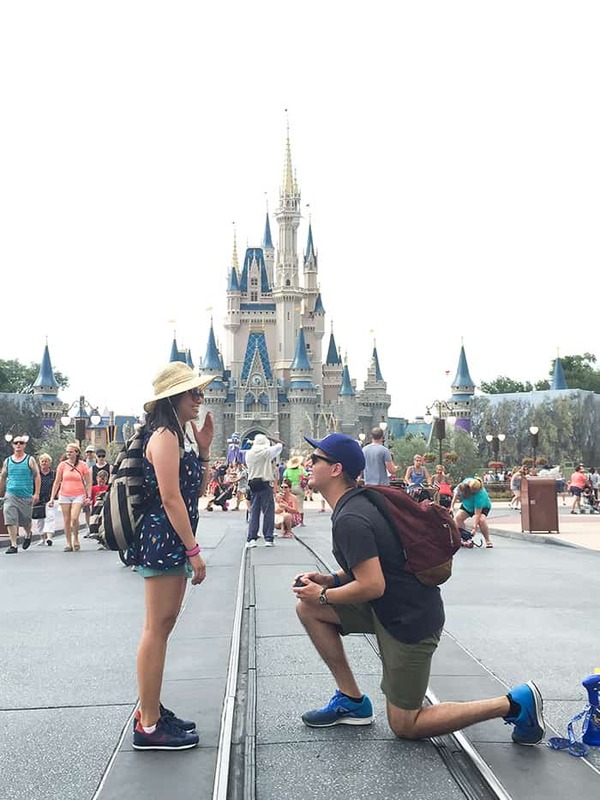 Last month, Alex and I went to Disney World for my birthday. We had visited the other parks (Epcot, Hollywood Studios, Animal Kingdom) earlier in the week. We saved the Magic Kingdom for the last day of my 20s. I had scheduled a jam packed day. We arrived at the park right when it opened. I had the entire day mapped out: a giant, massive cinnamon roll from Gaston’s Tavern for breakfast, Peter Pan, Haunted Mansion, Dumbo, character lunch at Crystal Palace (so I could take photos with Winnie the Pooh and friends! ), Seven Dwarfs Mine Train, Splash Mountain, Space Mountain, etc. I should have known something was up during lunch. Alex hardly touched his food (super unusual!) and he was surprisingly quiet (we normally talk our heads off during meals). After lunch, we walked by Cinderella’s Castle. Usually there is always a line of people waiting to get their photo taken in front of the castle. Luckily, there was no one there so I suggested we have a photo taken. 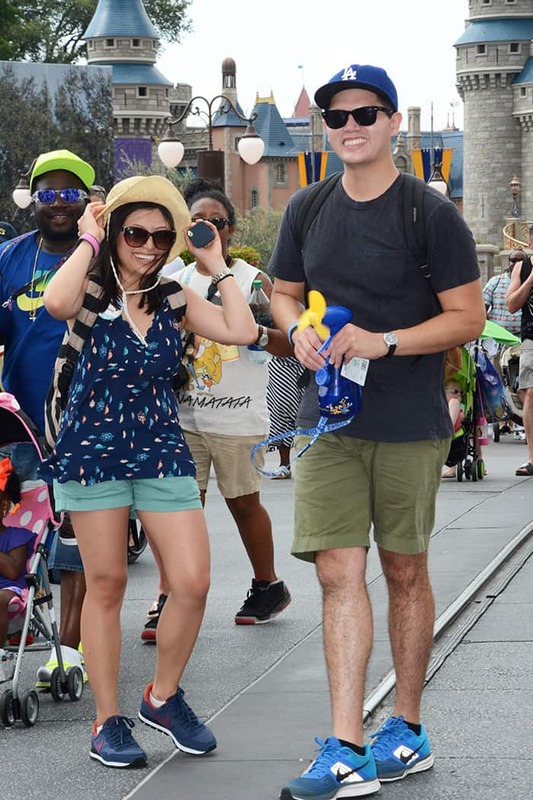 At all the Disney parks, they have photographers situated at various locations to take your photos. Normally, we hand over my phone because I like to keep track of all our photos. I knew something was up as soon as Alex handed over his phone to the photographer. Me: Uh…WHAT ARE YOU DOING? WHY ARE YOU DOING THIS IN PUBLIC?! PEOPLE ARE STARING! Alex: Will you marry me? Me: (Laughing) I don’t know whether to faint or vomit. STOP IT. Stop what you’re doing. I was laughing and giggling hysterically. I’m sure onlookers thought I was crazy. I also shouted “stop” and “no” about a dozen times. Once again, people thought I was insane. The thing is, within months of dating Alex (way back in 2009), I already knew marriage was in the cards for us. We had been joking about it forever and I knew it was just a matter of time. 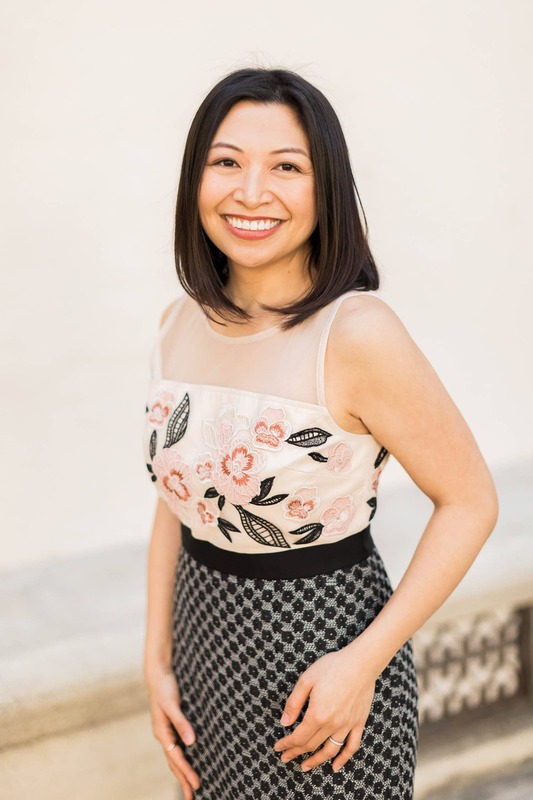 As my 30th birthday approached, I had been suspecting a proposal, however, that didn’t mean I was prepared for one. As soon as Alex dropped to one knee, I really had no idea whether I was going to faint, vomit, or cry uncontrollably. At this point, my hearing started getting fuzzy. I had to remind myself to breathe. I was thinking about my parents. Thinking about my un-manicured nails. I was also mad that he didn’t tell me dress better that morning. 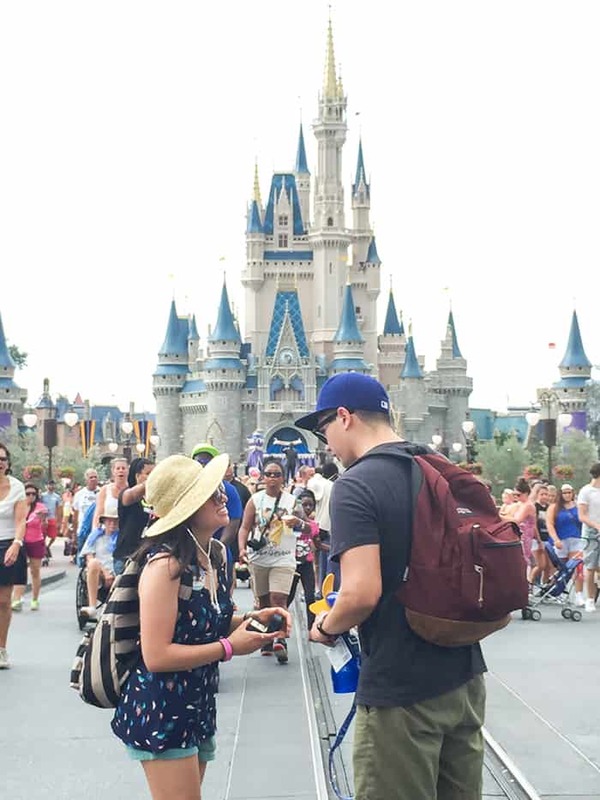 I did not expect (or want) to get proposed to while wearing a straw hat, sneakers, and a giant backpack. Me: Are you FOR REAL? Are YOU serious? Did you ask my parents? Do your parents know? DOES EVERYONE KNOW BUT ME? Alex: (This went on for a while. Alex was beginning to worry. See Alex’s serious face above.) YES. So after a ton of laughter and much explaining, I finally agreed and asked for ice cream. It was a hot and humid afternoon. I was sticky and sweaty. Ice cream seemed like the next logical step. By now, there was a crowd of strangers cheering and congratulating us. It was really sweet, but also totally awkward. Alex and I are the both the shy types so we quickly ducked into the ice cream shop. I got my giant scoop of mint chocolate chip and planned to enjoy it on a park bench. However, as soon as we exited the shop, it started to rain! Orlando summer weather is super bizarre and unpredictable. One minute it’s bright and sunny and the next minute there’s rain and thunder. At least we got in some photos before it started to pour! Now comes the tricky and stressful part…planning a wedding. 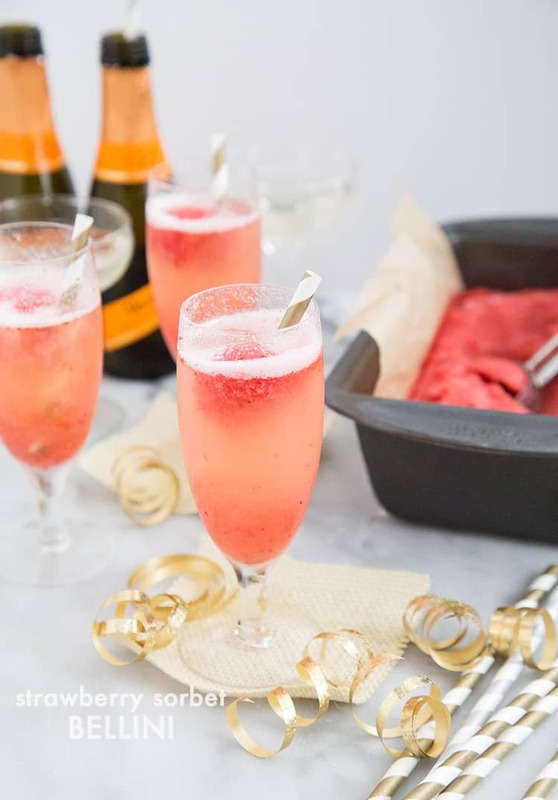 I’m hoping a couple glasses of this strawberry sorbet Bellini will make the venue search, Pinterest wedding boards, and dress shopping a lot easier. Place strawberries in the bowl of a food processor or blender. Add lemon juice and sugar. Pulse into a puree. Let puree chill in fridge until cold. Churn puree into ice cream maker according to your unit's instructions. Once the sorbet has reached a soft serve consistency, transfer into an airtight container and let rest in the freezer for at least 1 hours before serving. 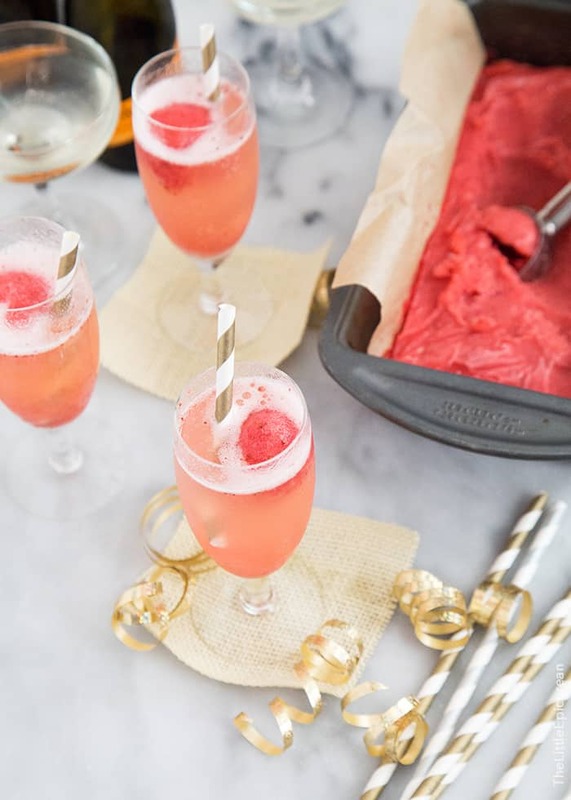 Add a small scoop of sorbet into a fluted champagne glass. Top with sparkling wine. Serve immediately. Such a cute story! You two are darling! Congrats, my friend! I’m so excited for you. congratulations!! Very happy for you and this drink is perfect for celebrating!! I had a similar reaction at my proposal too…and it was in private lol. congrats!! i think it’s cute that you weren’t totally prepared- you’ll remember that straw hat (and laugh about it) more than you would a put-together outfit. Congratulations!!! This is such a cute (and funny) story ! :) I wish you all the best ! OMG OMG OMG! I’m so happy for you! Congratulations! I’m selfishly hoping you’ll make your own wedding cake just so I can see a beautiful post done on it! Congrats, you two cuties! I’m so happy for you!!!!!!! Congratulations Maryanne and Alex!! 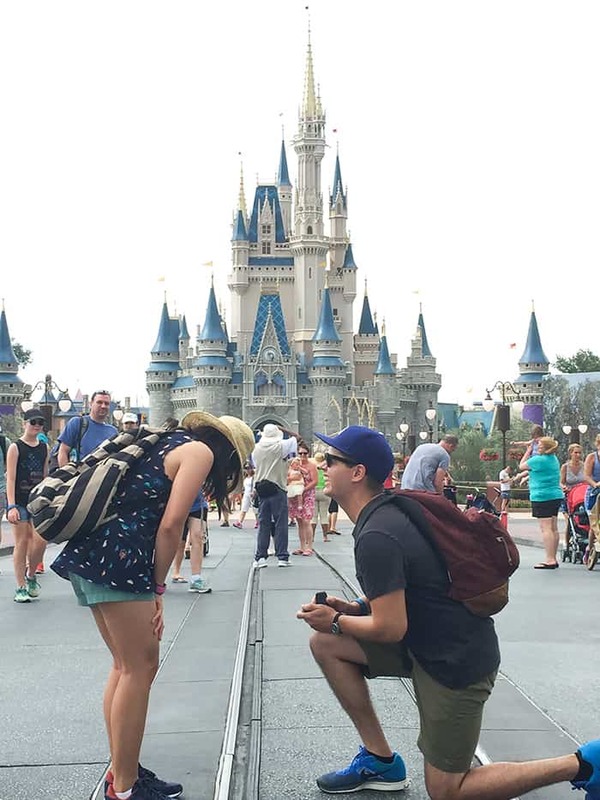 The cutest proposal ever!! And I love this Bellini! Perfect for a celebration!! Congratulations! I love the proposal story. You two are so cute!! 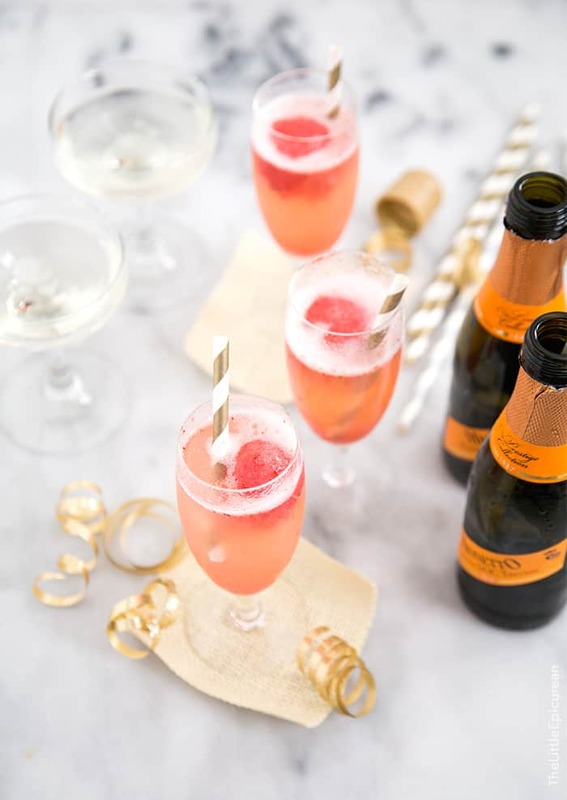 This bellini is the perfect way to celebrate. Congratulations girl! HAHA!!!! I love the ice cream ending to the story! But seriously, it is super sweet and romantic! This beautiful bellini is the way to celebrate! Gorgeous! Firstly – CONGRATULATIONS!!! You two are so adorable :) Welcome to the next step of your exciting adventure together! Congratulations Maryanne!! Best wishes for a long and happy marriage. Really like your blog by the way! This is so cute! Just got engaged myself! I love Prosecco! Will definitely try this recipe out! What a great surprise for you!!! Wish you and Alex a happy and healthy life together! !